Some women can be quite specific about which finger they will wear certain rings on. This is because they know about what it means when rings are worn on certain fingers. As a result of this, they will wear say a pearl ring on their little finger only. Then there are other women who will wear rings on any fingers they want. So let’s dive into this topic and find out how to wear a pearl ring! Each and every gemstone set into a ring comes with its own particular set of rituals for the ways in which they should be worn. These should be followed if you wish to obtain the maximum benefits according to the gemstones astrological sign. When it comes to pearls these are seen as pious and pure and is very closely linked with the Moon. As pearls are made from organic materials rather than minerals there are quite a few benefits to be gained if you do choose to wear yours on your little finger. The main pearl ring astrology benefits of wearing this piece of jewelry on the little finger is that it is believed to bring peace and calmness to the wearer. However, when it comes to wearing any pearl rings there are certain things you should consider if you really want to reap the astrological benefits of wearing such. Who Should Wear Pearl Rings Gold Or Silver? What Are The Benefits To Be Gained From Wearing A Pearl Ring? Although wearing a pearl ring on your little finger can prove very beneficial to you in many ways. 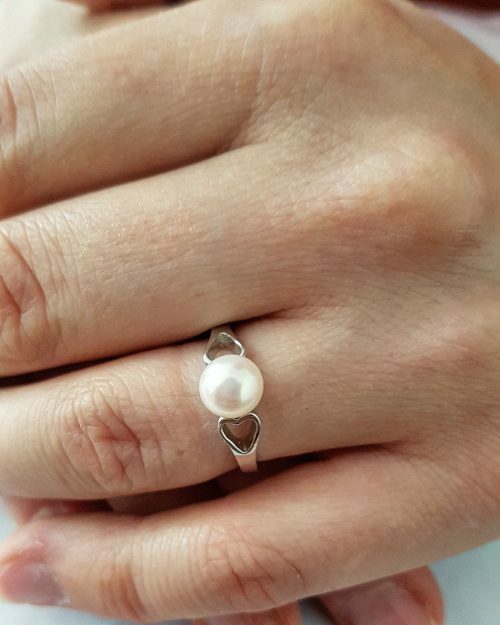 There are now many different very popular styles of pearl rings that you can wear and some of them, of course, won’t be suitable for wearing on the little finger on your right hand. Plus the actual size of the pearl ring settings will have an effect on what finger you should wear them. Rings that contain large pearls or that are made up of several different gemstones will, of course, look clumsy if worn on the little finger. Really the most suitable types of pearl rings to be worn on the little finger should be ones that are very simple in design and contain only one small dainty pearl in them. In fact, what style of pearl ring settings you choose is going to affect when, how and where you will wear it. So below we take a look at the different styles of pearl rings you can now wear and how they can be worn. These are very ornate and glamorous pieces of jewelry and many of these types of pearl rings will contain large pearls placed at the center of the design. Often you will find they are surrounded by intricate metal and other gemstones. Then there are others that will be made up of a cluster of small size pearls and other gemstones. All of which help to give such rings a very luxurious and dazzling look to them. This is the type of pearl rings you would wear out to a party or formal event. Ideally, such rings because of their size will sit nicely when worn on your ring or middle finger. These types of pearl ring settings are a lot more simple and subtle in design, but that doesn’t make them any less beautiful. These types will consist of one pearl that has been set into a silver, gold, or platinum setting. They may have a more quiet, understated look to them but you can now find such pearl rings with a more intricate band design and setting. In fact, these styles of solitaire pearl rings are becoming very popular with women of all ages today. Such rings because of their soft beauty are perfect for wearing when going out for a romantic meal with your partner. They are even becoming increasingly popular with women to wear as engagement rings instead of the conventional diamond solitaire ones. You could, of course, wear such rings on either the ring finger of either your right or left hand if you wish. Plus those with smaller pearls will, of course, look wonderful when worn on either little finger. These, of course, are a mixture of pearls and other gemstones that have been set in a row or cluster. Such pearl rings will tend to include three of four pearls and other gemstones such as emeralds, sapphires, rubies or diamonds. Either the pearls will be placed in line but with the other gemstones placed in between them, or they will be set in the center and then surrounded by the other gemstones. These types of rings are more versatile and can be worn at any time you like. They look wonderful when worn with your business outfit or with more formal wear. The best finger on which to wear such rings would, of course, be the ring finger on either hand. Now you know on which finger it is possible to wear such rings you need to think about the other kinds of accessories you can wear with yours. As pearls have a very classic beauty about them when you wear any pearl rings silver or gold setting keep all other jewelry worn with them very simple. To let the ring stand out wear a simple gold or silver chain necklace and a pair of either gold or silver earrings as these will help to tie your whole outfit together. However, younger women will, of course, want to go for a trendier look that still helps to show the femininity of the pearl ring they are wearing. For younger women, you may want to think about putting a headband on. But make sure you choose one that suits the look and style of your pearl ring settings. Otherwise, choose a headband that is in just one colour that will match the pearl or pearls in your ring perfectly. Of course, the best way to really let the beauty of any pearl ring you wear shine out is to have a set of beautifully manicured nails. A French manicure doesn’t only look wonderful, but really helps to complement any pearl jewelry that you may be wearing. But you don’t need to just go for a French manicure if you wish you could wear other coloured nail polishes. However, to really allow the beautiful luster of the pearls in your ring to shine out it is best to go with a natural colour. You can then apply a shimmery or glossy topcoat to it. Not only will your nails look beautiful but once you put on your pearl ring your hands will look very dainty yet fashionable. Above we’ve offered you a few ideas of how to wear a pearl ring. Of course, the way in which you wear yours is really down to the style of ring you’ve chosen. But if you keep in mind the above you are sure to be happy with whatever finger you decide to wear it on. Here at Pearlsonly.com, we have a wide array of different styles of pearl ring settings to choose from. So finding one that doesn’t only suit your particular tastes, but also your personality shouldn’t prove difficult. At the end, we hope you have a clearer idea on how to wear a pearl ring. Just make sure that when deciding on the style of pearl ring you wish to buy you choose one that suits the shape of your hand and fits comfortably on to the finger on which it will be worn.